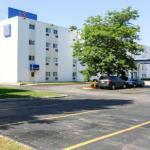 Located close to Interstate 95 this Portland motel offers Wi-Fi and rooms that feature a seating area. Central Portland is 3 miles away and Scarborough Downs Harness Racetrack is 15 minutesâ?? drive. Cable TV and a work desk are offered in each brightly coloured room at Portland Maine Motel 6. An en suite bathroom is also included. A 24-hour front desk is offered to guests along with fax and photocopying services. Laundry facilities are also available. The University of New England â?? Westbrook College Campus is 3 miles from Motel 6 Portland Maine. Portland Head Light is 20 minutesâ?? drive.